Paperback. Pub Date: 2009. Pages: 60 in Publisher: Hooked on Phonics Research shows that phonemic awareness helps children learn to read. 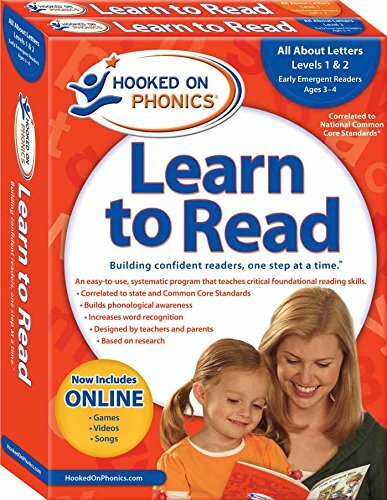 Hooked on Phonics Learn to Read Pre-K Complete uses a simple and fun approach to give your child a strong foundation in phonemic awareness. a crucial pre-reading skill. Teaches rhyming. beginning sounds. letter names and sounds. Includes engaging phonics-based activities. music videos. and online games. Designed for children ages 3 to 4. Contains both levels 1 and 2 of the Pre-K Learn to Read program in one convenient package. At Hooked on Phonics, we believe that every child loves to learn, so we focus on nurturing that thirst for knowledge with products that are fun, effective, and easy to use. We respond to a child’s natural curiosity and support families and teachers as they help children improve literacy skills. We celebrate every success so learning becomes a positive cycle that kids will love to repeat again and again. We meet all children at their level, engage their imaginations, and help them climb to the next level step by step. Every achievement ends in a celebration of success, an elevation of confidence, and an increase in self-esteem. As children master reading skills, they also lay the foundation for a lifetime of learning. It’s our goal to make a difference in children’s lives by making learning fun and easy. That’s why we’ve brought together a dedicated team of parents, leading educators, interactive designers, writers, and artists. Through collaboration, research, and testing, we continually develop innovative products and systems that teach children not only to learn but also to love learning.